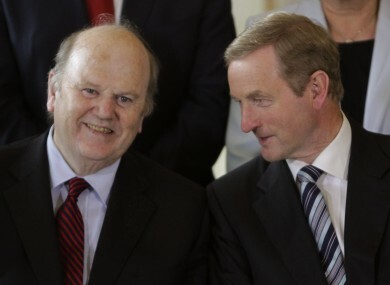 But Michael Noonan says Ireland’s low corporate tax rate “never was, never has been” up for discussion. MICHAEL NOONAN WILL close the controversial Double Irish tax loophole but will pitch a new “knowledge-development box” to lure business investment instead. In his Budget speech today, the Finance Minister said he would pull the shutters down on the internationally-criticised tax loophole which multinational companies like Google have exploited to shift millions in profits offshore virtually tax-free. Noonan said from next year all new companies which were registered in Ireland would also need to be tax resident in the country. Companies set up under the existing scheme would need to comply with the laws before the start of 2021, he said. He said the new arrangement would “align with best practice internationally” and the government wanted to support companies creating “real jobs” in Ireland. “By taking action now and making this change as part of our broader reform of the corporate-tax system, we are creating certainty for investors,” he said. Noonan added the move would not stop international tax avoidance single handedly, a nod to the OECD’s ongoing work to draw up a framework to deal with the problems of multinationals using differences in countries’ tax laws to whittle down their bills. But he said Ireland’s headline 12.5% corporate tax rate was “at the heart” of its foreign, direct-investment strategy and that was off the table when it came to any tax changes. “The 12.5% tax rate never has been and never will be up for discussion,” he said. Noonan also announced the government would introduce a “knowledge box” next year after consultation on the plan. The move would put Ireland in line with countries like the UK and Netherlands which already had generous patent-box tax deals in place to lure investment for research and new products. “(It will be) best in class and at a low, competitive and sustainable tax rate,” Noonan said. Since last year, the UK has been phasing in a discounted corporate tax rate of only 10% on profits stemming from new patents, although the European Commission is currently looking at patent-box schemes to see if they constitute illegal state aid. Changes welcome, but what’s with the six-year wait? While the government’s move to stamp out the Double Irish tax dodge was widely praised, Noonan drew criticism for factoring in a six-year phase-in period for existing companies as part of the deal. The Debt and Development Coalition Ireland (DDCI) said the proposed patent box scheme would not support real innovation if it was anything like the UK scheme. “The government is playing musical chairs on corporate tax; while it is welcome that the ‘Double Irish’ scheme will be closed, the phased approach to its closure provides corporations with 6 years to avail of new tax-dodging mechanisms,” DDCI’s Nessa Ní Chasaide said. So...double Irish structures on the way out, but over 6 years if already implemented? Ooh, it burns. Well, stings. Probably just a bruise. Business group Ibec’s CEO, Danny McCoy, said it was a good Budget for jobs and growth and the government had “responded assertively to the changing global tax environment”. “Ireland has sent out a clear signal that we will continue to compete aggressively for mobile investment,” he said. Email “The Double Irish is dead, long live the 'knowledge-development box'”. Feedback on “The Double Irish is dead, long live the 'knowledge-development box'”.